[simage=153,288,y,left,]I just installed WPTouch, the WordPress plugin that serves up a clean and simple mobile version of your site to visitors using smartphones and other mobile devices. A couple of years back, I tried to do the same thing with a different WP plugin, but at that point things just weren’t ready (for one thing, there were so many different devices and user agent strings that detection was iffy at best), and I ended up having to remove the plugin. WPTouch, on the other hand, was pretty much ready to go right out of the box. [simage=155,288,y,left,]After initial testing, I enabled Google AdSense for Mobile, which was as simple as pasting in my publisher ID. The ads show up fine on a stock Motorola Droid and an iPhone emulator, but failed to appear on my Droid, which is running Bugless Beast 0.6. I’m not too worried about that, though, as I suspect the hacked browser might have an ad-blocker in there, and either way, I don’t see the Bugless Beast user community as being a source of significant ad revenue for me, so I’m holding off on investigating the issue further. For now, I’m just glad that there’s finally a plugin like WPTouch out there, that just works like it claims it does. Ok, I’m fairly certain the Blackberry doesn’t provide any simple way for people to transfer their mp3s into it for the purpose of being ringtones. So, either you’re limited to whatever tasteless drivel your wireless provider deems most profitable, or you can work around the stupidity. Now, I love Shakira and all, but with my provider, Verizon, I couldn’t even find where to buy mp3 ring tones, so I was left instead with a meager selection of free MIDI crap. It was time to work around the stupidity. For this recipe, you’ll need some web space. There’s plenty of ways to get that for free, mostly involving allowing the hosting service to cover 90% of the screen with their branded crapola. Or, consider that a domain and hosting for a month at godaddy.com can run you as low as $10, and offers the prospect of loading unlimited mp3s on your phone, and the investment starts to sound pretty good. Yay, I made a web page! Now, here’s the key. You need to put the mp3 on your web space as well, and it’s also wise to name it the same thing as you’re referencing in your HyperText Markup Language. If links confuse you, just make sure to put the file in the same folder as the .html file, then put the name of the file between quotes after the a href part. Now, go to your newly created page (name it something short like bb.htm–it will become obvious why when your giant fingers try to type in the URL on that tiny keyboard). Select the link and open it on your blackberry, and voila! Your PDA downloads the file, saves it into the Tunes folder, and you can make it a ringtone or play it to annoy your friends. Unless you get an error like the following: HTTP Request failed: Item too large. Then, it’s time to go back and edit down your mp3, because it’s obviously over 500 kilobytes in size. That’s right, you can’t request an object much larger than that, so you’re SOL if you can’t get your file smaller than that. So, you ask, how do I do that? Well, the first step is Audacity, the free audio-editing software that packs a serious punch, runs stably, and must therefore have been programmed by the nicest, bestest people on Earth. Once you’ve got that downloaded, follow the included instructions on obtaining the LAME mp3 encoding codec, or any other mp3 codec you want to use. The Blackberry doesn’t much like songs encoded under 32kbps, but even so, you can get almost 2 minutes of audio in under 500k at that bitrate, and by fiddling with stereo/mono settings, you might get even more. 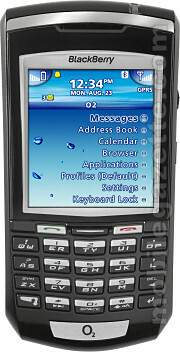 Remember, if you wanted something that could play real, whole songs longer than 2:00 long, you should’ve gotten a Treo. And if your $500 Blackberry left you too poor for another ‘smartphone‘ or an iPod, just learn to love punk rock.